The limits of science are the limits of scientific civilization. One of my most frequently accessed posts is titled following Wittgenstein’s Tractatus Logico-Philosophicus section 5.6, “The limits of my language are the limits of my world” (“Die grenzen meiner sprache sind die grenzen meiner welt”). I noted in Contextualizing Wittgenstein that this earlier post on Wittgenstein was posted on Reddit and as a result gained a large number of views — a larger number, at least, than my posts usually receive. If there is a general principle that can be derived from Tractatus 5.6, one application of this general principle would be the idea that the limits of science are the limits of scientific civilization. In the same vein we could assert that the limits of agriculture are the limits of agrarian civilization (or even, “the limits of agriculture are the limits of biocentric civilization”), and the limits of technology are the limits of technological civilization, and so forth. Another way to express this idea would be to say, the limits of science are the limits of industrial-technological civilization, in so far as our industrial-technological civilization belongs to the genus of scientific civilizations. Recently I have taken up the problem of scientific civilizations in Folk Concepts of Scientific Civilization, Types of Scientific Civilization, Suboptimal Civilizations, Addendum on Suboptimal Civilizations, David Hume and Scientific Civilization, The Relevance of Philosophy of Science to Scientific Civilization, and Addendum on the Stages of Civilization, inter alia. None of this, as yet, is a systematic treatment of the idea of scientific civilization, though there are many ideas here that can some day be integrated into a more comprehensive synthesis. What does it mean to live in a scientific civilization constrained by the limits of science? One of the points that I sought to make in my earlier post on Tractatus 5.6 was a scientific interpretation of Wittgenstein’s aphorism, acknowledging that the different idioms we employ to think about the world involve different conceptions of the world. In that post I wrote, “…scientific theories often broaden our horizons and allow us to see and to understand things of which we were previously unaware. But a scientific theory, being a particular idiom as it is, may also limit us, and limit the way we see the world.” This is part of what it means to be constrained by the limits of science: our scientific idioms constrain the conceptual framework we use to understand ourselves and our civilization. Significantly in this context, different scientific idioms are possible. Indeed, distinct sciences are possible. We have had an historical succession of scientific idioms, which could also be called a succession of distinct sciences — something that could be presented as a Wittgensteinian formulation of Thomas Kuhn — according to which one scientific paradigm has replaced another over time. There is also the unrealized possibility of different origins of science, and different developmental pathways of science, in different civilizations. This is an idea I explored in Types of Scientific Civilization. A civilization might develop science in a different way than science emerged in terrestrial history. A civilization might begin with a different mathematical formalism or a different logic. Perhaps logic itself might begin with the kind of logical pluralism we know today, which would contrast sharply with the logical monism that has marked most of human history. Different sciences might develop in a different order. The ancient Greeks developed an axiomatic geometry, but no scientific biology. But the idea of natural selection is, in itself, no more difficult than the idea of axiomatic geometry, and could have developed first. A civilization might fail to develop axiomatic geometry and instead develop a scientific biology in its earliest history — its equivalent of our classical antiquity — and this kind of early biological knowledge would probably take agricultural civilization in a profoundly different direction. There may be (somewhere in the universe) scientific agrarian civilizations that are qualitatively distinct from both agrarian-ecclesiastical civilization and industrial-technological civilization. Thus the developmental sequence of sciences in a civilization — which sciences are developed in what order, and to what extent — will shape the scientific civilization that eventually emerges from this sequence (if it does in fact emerge). Is this sequence an historical accident? That is a difficult question that I will not attempt to answer at present. There are, then, many possibilities for scientific civilizations, and we have not, with the history of terrestrial civilizations, fully explored (much less exhausted) these possibilities. But scientific civilizations also come with limitations that are intrinsic to scientific knowledge. In my Centauri Dreams post, “The Scientific Imperative of Human Spaceflight,” I argued that the science of industrial-technological civilization, essentially narrowed by its participation in the STEM cycle that drives our civilization, is riddled with blind spots, and these blind spots mean that the civilization built on this science is riddled with blind spots. This should not be a surprising conclusion, though I suspect few will agree with me. There is a comment on my Centauri Dreams post that implies I am arguing for the role of mystical experiences in civilization; this is not my purpose or my intention. This is simply a misunderstanding. But, in fact, the better I am understood probably the less likely it will be that others will agree with me. In another context, in A Fly in the Ointment, I argued that science is a particular branch of philosophy — that philosophy also known as methodological naturalism — which subverts the view (predictably prevalent in industrial-technological civilization) that if philosophy has any legitimacy at all, it is because it is a kind of marginal science in its own right. More often, philosophy is simply viewed as a kind of failed science. Philosophy is not a kind of science. Science, on the contrary, is a kind of philosophy. This is not a common view today, but that is my framework for interpreting and understanding scientific civilization. It follows from this that a philosophical civilization would not necessarily be a kind of scientific civilization (the philosophy of such a civilization might or might not be the philosophy that we identify as science), but that our scientific civilization is a kind of philosophical civilization. Philosophy is a much wider field of study, and it is from philosophy that we can expect to address the blind spots of science and the scientific civilization that has grown from science. So the limits both of science and scientific civilization can be addressed, but only from a more comprehensive perspective, and that more comprehensive perspective is not possible from within scientific civilization. The young Ludwig Wittgenstein in 1905. This past December a link to my 2011 post The limits of my language are the limits of my world was posted on a Reddit philosophy discussion forum. 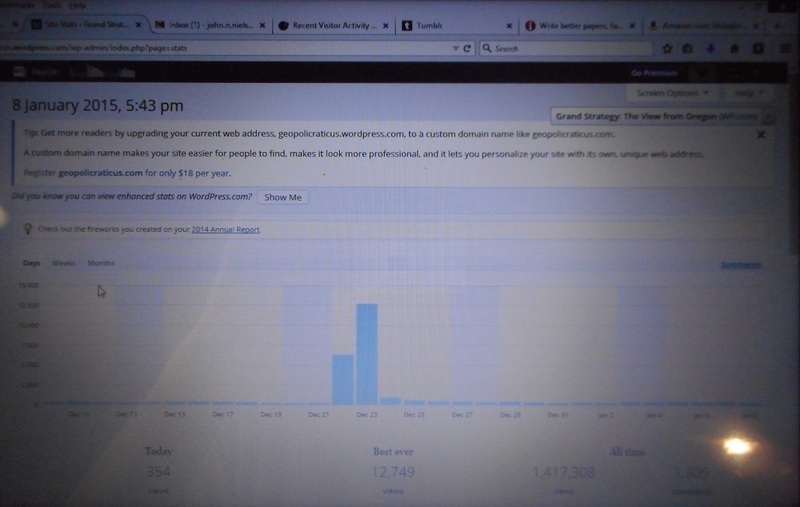 I have never paid any attention to Reddit, but I guess it gets a lot of traffic, since as a result of this link I received a peak number of 12,749 hits on 22 December 2014 — most of them from Reddit, but also a substantial number from Hackernews, which had apparently re-posted the link. This is the greatest number of hits that any of my individual posts have received. The spike in traffic encouraged me to look at my old post again, and think about what I had said in it. My past effort left much to be desired, and as a result of all the traffic I did receive one perceptive comment on the post itself (apart from all those comments on the Reddit page, where I am not registered so could not respond), and this also gave me reason to think it over again. In retrospect what bothers me the most (but which was not a focus of any of the comments) is that I had taken this popular Wittgenstein quote out of context and discussed it without systematically relating it to the corpus of Wittgenstein’s thought from which it drawn. In defense of my former self, I can say that it was merely a blog post, and pretty much written off the top of my head. It would take a book-length study, or several book-length studies, to adequately contextualize the Wittgenstein quote that I had plucked out as an aphorism and to give it a proper textual exegesis. But my scholarly conscience bothers me a bit, as my conscience has also been bothering me about a post I wrote about a line plucked out of Einstein in Unpacking an Einstein Aphorism. I don’t repudiate what I wrote in that post, any more than I repudiate what I wrote in my brief post on Wittgenstein, but I do intend to return to this Einstein passage and write about it again in proper context. The aphorisms taken out of the Tractatus must be understood in the context of the work from which they are taken, and the work itself much be understood in the context of the Wittgenstein’s thought — no small task, especially given the sheer volume of Wittgenstein scholarship. In the case of the Tractatus we are quite fortunate to possess two closely related posthumously published texts by Wittgenstein, Notebooks 1914-1916, edited by G.H. Von Wright and G.E.M. Anscombe, as well as Prototractatus: An Early Version of the Tractatus Logico-Philosophicus, edited by B.F. McGuinness, T. Nyberg, and G.H. Von Wright. Both of these works generously overlap with the completed text of the Tractatus and provide material not included in the published text. In addition, there are numerous personal letters between Wittgenstein, his philosophical friends, publishers, and translators, and a commentary tradition starting with Russell’s introduction written for the first English language edition and continuing up to the present day. I myself own at least a dozen commentaries on the Tractatus alone (excluding works on Wittgenstein himself or on his later work). That is a lot of context to grind one’s way through. Some of the confusion surrounding aphorisms attributed to Wittgenstein is understandable because Wittgenstein did write some aphorisms (many of them collected in the posthumously published Culture and Value). However, the sections of the Tractatus that have been taken out of context and used as aphorisms are not aphorisms, but rather sections of a treatise that was composed in aphoristic style. This may sound like an overly-subtle distinction, but it is a distinction that makes a difference. An aphorism is intended to stand on its own; a work composed in aphoristic style is intended to be read and understood as a whole. Wittgenstein shares this confusing character of his style with the writings of other philosophers who composed works in aphoristic form, notably Nietzsche and Kierkegaard. Walter Kaufmann, the noted Nietzsche scholar, often went out of his way to point out that Nietzsche’s aphorisms are part of books and are intended to be read as part of a text that develops an idea throughout. I think part of my scholarly conscience grows out of reading so much of Kaufmann at an early age. When Kaufmann wrote about Nietzsche the latter was still a highly controversial figure, so Kaufmann was at pains to be on his best scholarly behavior. I think that it was also Kaufmann who said that Nietzsche often wrote too well for his own good, as he is often attacked for passages that he was not himself defending, but which he formulated so concisely that his phraseology was taken as a kind of advocacy. The same might be said of Kierkegaard and Wittgenstein. Kierkegaard, of whom I just wrote in Kierkegaard and Russell on Rigor, takes this confusion of the aphorism taken from an aphoristic work to a higher level by publishing pseudonymous works written in aphoristic style, so that any “aphorism” attributed to Kierkegaard may be be a single sentence plucked from a longer work which moreover is written under a pseudonym. Does this “aphorism” represent Kierkegaard’s views? The question is as fraught as how much of Plato’s Socrates represents the views of the historical Socrates. Given the volume of scholarship available on a figure like Wittgenstein, is it even possible to write something like a blog post without entirely misrepresenting one’s source? In other words, is it possible to blog with intellectual integrity? A lot of my early blog posts were written off the top of my head, often from memory without bothering to consult an actual text. That seemed sufficient at the time. None of these posts would stand up to serious critical scrutiny. Since then, my posts have become longer, better researched, and much less frequent. With blog posts like this, one is likely to lose all but the most dedicated readers, but in the event that a post should receive unexpected attention (like my Wittgenstein post that was linked on Reddit), it would stand up a little better to critical scrutiny. Aware of this, I started my second blog, Grand Strategy Annex, but this, too, has grown into something more serious and I hesitate even there to post poorly thought-out ideas — though I am still guilty of this on occasion (especially with my recent post on gray goo). A lot of what I put in my early blog posts consisted of ideas to which I attached no great importance. My first post on civilization, for example — Today’s Thought on Civilization — was something I wrote because it wasn’t one of the ideas I was working on in my manuscripts, hence of no great importance. However, that post led to further posts, and now I have a significant tranche of posts on civilization. I also have a much clearer idea of civilization than I had six years ago, and the philosophy of civilization now constitutes a central research interest of mine. Most of what I think about civilization now goes on my blogs, with no thought of “saving” it for a manuscript because I consider it too important for a mere blog post. So my own attitude to my own writing has changed over the time I’ve been blogging on strategy, civilization, and philosophy. In any case, I now hope to return to my post on The limits of my language are the limits of my world and to give this idea an exposition that does not treat this passage from the Tractatus like an aphorism, which it is not. Skimming though a number of Wittgenstein’s works and commentaries over the past new days I already have a idea of how I will do this, but it will take me some time to get to it. And it would take more time yet to then take the consequences of an inquiry into Wittgenstein and apply it to the interpretation of quantum theory, which was what I did my my original post. To do justice to that idea would definitely require a work of some scope. But I am not entirely ready to give up my intellectually opportunistic ways, seizing upon any idea that strikes me as interesting at the moment and writing about whatever seems related to it. In this picture you can clearly see the spike in my stats generated by the Reddit link to my post on Wittgenstein. You can also see that the best day ever was 12,749, which was the second day of the spike in traffic. Brouwer and Wittgenstein were contemporaries, with the whole of Wittgenstein’s years contained within those of Brouwer’s (Wittgenstein lived 1889 to 1951 while Brouwer lived the longer life from 1881 to 1966). It is mildly ironic that even as Brouwer’s followers were playing down his mysticism and trying to extract only the mathematical content from his intuitionist philosophy (even the faithful Heyting distanced himself from Brouwer’s mysticism), Wittgenstein’s writings reached a much larger public which resulted in the mystical content of Wittgenstein’s works being played up and the early Wittgenstein himself, very much the logician following in the tradition of Frege and Russell, presented as a mystic. Wittgenstein’s distinction between saying and showing, a doctrine that dates from the Tractatus (cf. sections 4.113 and following), is often adduced in expositions of his alleged mysticism. According to Wittgenstein’s distinction, some things can be said but cannot be shown, while other things can be shown but cannot be said. While to my knowledge Wittgenstein never used the term “ineffable,” that which can be shown but cannot be said would seem to be a paradigm case of the ineffable. And since Wittgenstein identified a substantial portion of our experience as showable although unsayable, the ineffable seems then to play a central role in his thought. This puts Wittgenstein firmly in the company of figures like, say, St. Symeon the New Theologian (also, like Wittgenstein, an ascetic), which makes the case for his mysticism. There is another ellipsis common to both Brouwer and Wittgenstein, and that is despite Brouwer’s openly professed intuitionism, which can be considered a species of constructivism (this latter is a point that needs to be separately argued, but I will only pass over it here with a single mention), and despite the strict finitism of the later Wittgenstein, which can also be considered a species of constructivism, neither Brouwer nor Wittgenstein employ Kantian language or Kantian formulations. No doubt there are implicit references to Kant in both, but I am not aware of any systematic references to Kant in the work of either philosopher. This is significant. Both Brouwer and Wittgenstein were philosophers of the European continent, where the influence of Kant remains strong even as his reputation waxes and wanes over the generations. Kant was an early constructivist, or, rather, a constructivist before constructivism was explicitly formulated, and therefore sometimes called a proto-constructivist — although I have pointed out an obvious non-constructive dimension to Kant’s thought despite his proto-constructivism (which I do not deny, notwithstanding Kant’s non-constructive arguments in the first Critique). Kant’s classic proto-constructivist formulation is that the synthetic a priori truths of mathematics must be constructed, or “exhibited in intuition.” It is this latter idea, of a concept being exhibited in intuition, that has been particularly influential. But what does it mean? 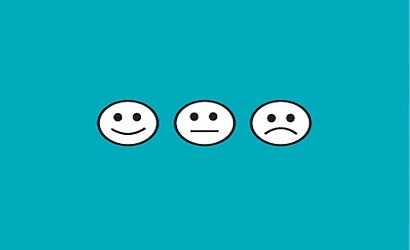 Obviously, a formulation like this has invited many interpretations. The approaches of Brouwer and the later Wittgenstein could be considered different ways of exhibiting a concept in intuition. Brouwer, by casting out the law of the excluded middle from mathematics (at least in infinitistic contexts), assured that double negation was not equivalent to the truth simpliciter, so that even if you know that it is not the case that x is false, you still don’t know that x is true. (On the law of the excluded middle cf. P or not-P.) The later Wittgenstein’s insistence upon working out how a particular term is used and not merely settling for some schematic meaning (think of slogans like “don’t ask for the meaning, ask for the use” and “back to the rough ground”) similarly forces one to consider concrete instances rather than accepting (non-constructive) arguments for the way that things putatively must be, rather than how they are in actual fact. Both Wittgenstein’s finitism and Brouwer’s intuitionism would look with equal distaste upon, for example, proving that every set can be well-ordered without actually showing (i.e., exhibiting) such an order — also, the impossibility of exhaustively showing (i.e., exhibiting in intuition) that every set can be well-ordered if one acknowledges an infinity of sets. I give this latter example because I think it was largely the perceived excesses of set theory and Cantor’s transfinite number theory that were essentially responsible for the reaction among some mathematicians that led to constructivism. Cantor was a great mathematical innovator, and his radical contributions to mathematics spurred foundationalists like Frege (who objected to Cantor’s methods but not his results) and Russell to attempt to construct philosophico-mathematical justifications, i.e., foundations, that would legitimize that which Cantor had wrought. In other words, mathematics would show its justification; in contrast, the foundationalist project to assure the legitimacy of the flights of non-constructive mathematics was wrong-headed in its very conception, because nothing that we say is going to change the fact that non-constructive thought that derives its force from proof, i.e., from what is said, does not show its justification on its face. Its justification must be established because it does not show itself. This is what “foundations” are for. Note: There is also an element of intellectual ascesis in Dummett’s idea of a conservative extension of a theory, and this corresponds to the asceticism of Wittgenstein’s character, and, by extension, to the asceticism of Wittgenstein’s thought — asceticism being one of the clear continuities between the earlier and the later Wittgenstein — like the implicit development of constructivist themes. But it was not only the later Wittgenstein who reacted with others against Cantor. It seems to me that the saying/showing distinction of the Tractatus is a distinction not only between that which can be said and that which can be shown, but also a distinction between that which is established by argument, possibly non-constructive argument, and that which is exhibited in intuition, i.e., constructed. If this is right, Wittgenstein showed an early sensitivity to the possibility of constructivist thought, and his later development might be understood as a development of the constructivist strand within his thinking, making Wittgenstein’s development more linear than is often recognized (though there are many scholars who argue for the unity of Wittgenstein’s development on different principles). The saying/showing distinction may be the acorn from which the oak tree of the Philosophical Investigations (and the subsequently published posthumous works) grew. For the early Wittgenstein, the distinction between saying and showing was thoroughly integrated into his idea of logic, and while in the later sections of the Tractatus the mysticism of what which can only be shown but cannot be said becomes more evident, it is impossible to say whether it was the logical impulse that prevailed, and served as the inspiration for the mysticism, or whether it was the mystic impulse that prevailed, and served as the pretext for formulating the logical doctrines. But the logical doctrines are clearly present in the Tractatus, and serve as the exposition of Wittgenstein’s ideas, even up to the famous metaphor when Wittgenstein says that the propositions of the Tractatus are like a ladder than one must cast away after having climbed up and over it. Just as there is a mathematical content to Brouwer’s mysticism, so too there is a logical content to Wittgenstein’s mysticism. It is, in fact, likely that Wittgenstein’s distinction between saying and showing was suggested to him by what is now called the “picture theory of meaning” given an exposition in the Tractatus. Few philosophers today defend Wittgenstein’s picture theory of meaning, but it is central to the metaphysics of the Tractatus. For Wittgenstein, the logical structure of a proposition can be shown but not said. Since for Wittgenstein in his Tractarian period, “The facts in logical space are the world” (1.13), and “In the proposition the thought is expressed perceptibly through the senses” (3.1) — i.e., the proposition literally exhibits its structure in sensory intuition — thus, “The proposition is a picture of reality.” (4.01) One might even say that a proposition exhibits the world in intuition. Today these formulations strike us as a bit odd, because we think of anything that can be formulated in logical terms as a paradigm case of something that can be said, and very possibly also something that may not be showable. For us, logic is a language is among languages, and one way among many to express the world; for the early Wittgenstein, on the contrary, logic is the structure of the world. It shows itself because the world shows itself, and after showing itself there is nothing more to be said. The only appropriate response is silence. As we all know from the final sentence of the Tractatus, whereof one cannot speak, thereof one must remain silent. According to the Wittgenstein of the Tractatus, all scientific questions can be asked and all scientific questions can be answered (shades of Hilbert’s “Wir müssen wissen. Wir werden wissen.” — which Per Martin-Löf has called Hilbert’s solvability axiom, and which is the very antithesis of Brouwer’s rejection of the law of the excluded middle), but even when we have answered all scientific questions, the problems of life remain untouched. As implied by the early Wittgenstein’s insistence upon the solvability of all scientific questions, the metaphysics of Brouwer and Wittgenstein were very different. Their common constructivism does not prevent their having fundamental, I might even say foundational, differences. Also, while Wittgenstein comes across in a melancholic fashion (a lot like Plotinus, another philosophical mystic), he is not fixated on the evils of the world in the same way that Brouwer was. If both Brouwer and Wittgenstein can be called mystics, they are mystics belonging to different traditions. Brouwer was a choleric mystic while Wittgenstein was melancholic mystic. A couple of days ago in describing my pilgrimage to Kinn I suggested that the phenomenon of pilgrimage is a Wittgensteinian “form of life,” and as a form of life we may understand it better if we confine ourselves to the material infrastructure while setting aside the formal superstructure that surrounds the form of life we call pilgrimage. But in a fine-grained account of pilgrimage we must distinguish between those forms of pilgrimage that, when taking the long view of the big picture, become conflated. As I attempted to show, in different ways, in Epistemic Orders of Magnitude and P or not-P, both la longue durée and the fine-grained view have their place in our epistemic development — respectively, and roughly, they represent the non-constructive and the constructive perspectives on experience — and we ought to be equally diligent in exploring the consequences of each perspective, since we have something important to learn from each. I tried to suggest a similarly comprehensive synthesis yesterday in A Meditation upon the Petroglyphs of Ausevik, when remarking that an extrapolation of a personal philosophy of history, when drawn out to a sufficient extent coincides with the history of the world entire. In other words, non-constructivism represents the furthest reach of constructivist thought, which immediately suggests the contrary perspective, i.e., that constructivism represents the furthest reach of non-constructive thought. Constructivism is non-constructivism in extremis; non-construtivism is constructivism in extremis. To translate this once again into historico-personal terms, the history of the world entire coincides with an intimately personal philosophy of history when the former is extrapolated to the greatest extent of its possible scope. In a fine-grained account of pilgrimage (in contradistinction to pilgrimage understood in outline, in the context of la longue durée), at the level of personal experience that is constructive because every detail is of necessity immediately exhibited in intuition and nothing whatsoever is demonstrated, we can distinguish many forms of pilgrimage. There are religious pilgrimages, such as the Sunnivaleia, there are personal pilgrimages, such as my pilgrimage to Kinn, there are aesthetic pilgrimages, such as when the custom dictated the young gentlemen of good families and fortune would take the “Grand Tour” of Europe, there are political pilgrimages, as when a candidate for office visits a politically significant place — and there are even philosophical pilgrimages. I have previously made some minor philosophical pilgrimages, as when I sought out Kierkegaard’s grave in Copenhagen and similarly visited Schopenhauer’s grave in Frankfurt. 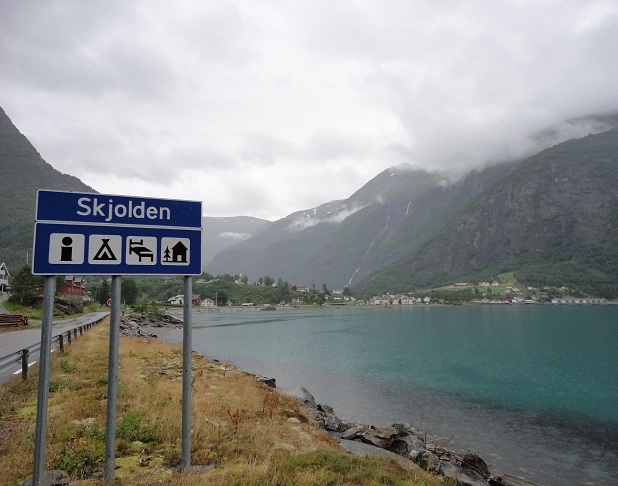 Today I made another philosophical pilgrimage, by visiting the small town of Skjolden, where Wittgenstein spent time working on the ideas that would later becomes the Tractatus Logico-Philosophicus. In the letters that Wittgenstein subsequently exchanged with his acquaintances in Skjolden (which have, of course, been published along with the rest of his correspondence), the people of Skjolden almost always close their letters by observing that Skjolden is as it always was and ever will be, essentially unchanged in the passage of time. I wrote about this previously in The Charms of Small Town Norway. 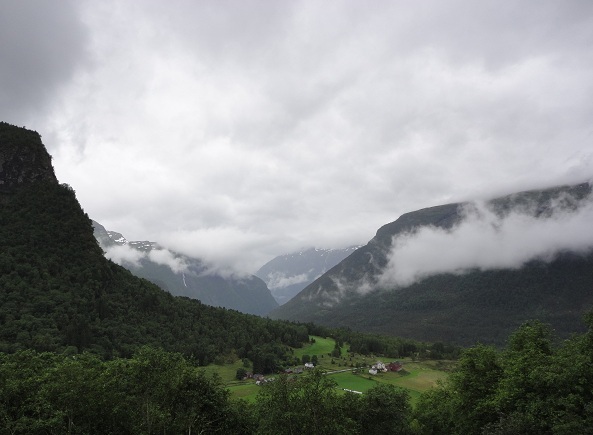 It seems to be true that life changes very slowly, almost imperceptibly, in the fjord country of Norway, as life always changes slowly in isolated, mountainous regions the world over. The peoples who retreat from the onrushing advance of civilization to the margins of the world where they will not be bothered, are not the kind of peoples who wish to indulge in change for the sake of change. It is this latter attitude that typifies industrial-technological civilization, which is still largely confined to the regions of the world fully given over to agricultural civilization. The margins of the world before industrialization largely coincide with the margins of the world after industrialization. Wittgenstein, I think, left little impact upon Skjolden. He didn’t make waves, as it were, and didn’t want to make waves. 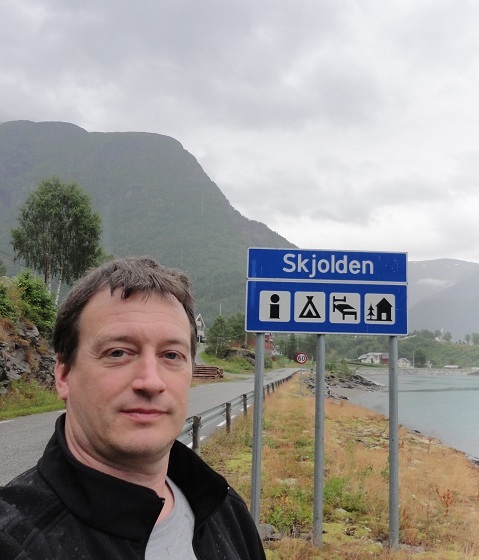 Life in Skjolden is probably little changed in essentials from when Wittgenstein isolated himself in a small, bare hut at the end of a fjord in order to think and write about logic. I think that Wittgenstein would have liked this — or, at least, that he would have preferred this near absence of influence. The fjords are unchanged since Wittgenstein lived here, even if life has been modernized, and they still provide a refuge for those who would seek a world largely untouched by what Wittgenstein in his later years would call, “the main current of European and American civilization,” from which he felt profoundly alienated. 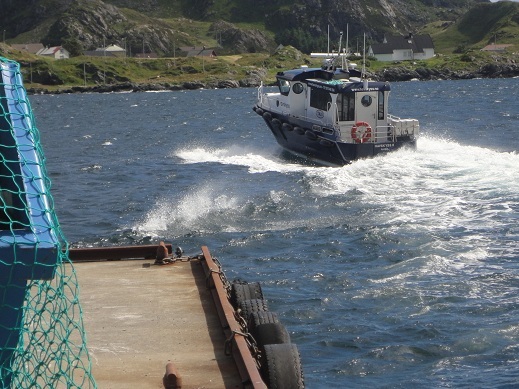 The boat that brought us from Florø to Kinn — six passengers total, including my sister and me. 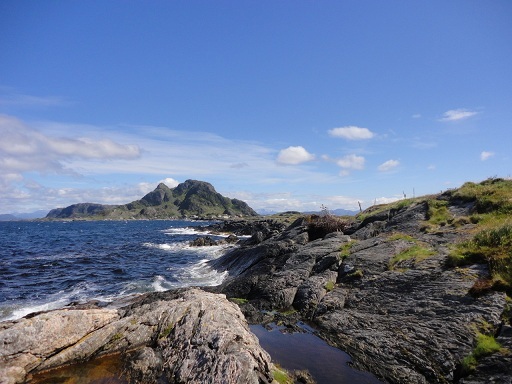 One of the westernmost islands of Norway is Kinn, which can be reached by boat from Florø. 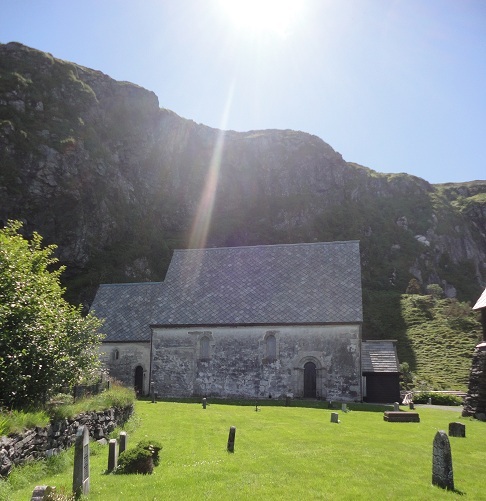 On Kinn there is a Romanesque church, one of the oldest stone churches in Norway, and also, like the island, perhaps the westernmost church of Norway. The island and the church were the object of pilgrimage in the middle ages. There is a legend, of course, and it is the Legend of Saint Sunniva. The Romanesque church on the island of Kinn. HISTORY OF THE CHURCH AND STATE IN NORWAY: FROM THE TENTH TO THE SIXTEENTH CENTURY, BY THOMAS B. WILLSON, M.A. While Sunniva herself washed up on the island of Selje, her sisters came to rest on different islands. Her sister Ingeborg washed up on the island of Moster, and the other sister, Borni, came to rest on Kinn. 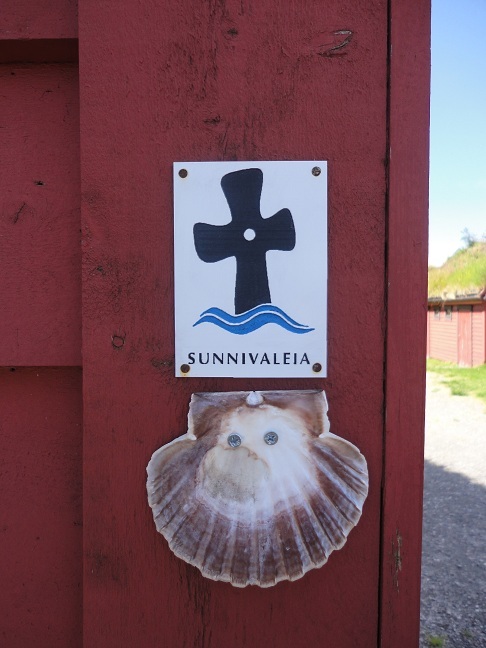 A symbol of a Sunnivaleia pilgrimage way on one of the buildings next to the church on Kinn. We know from other historical accounts that Christian monks from Ireland, seeking both complete isolation from the world and to completely place their fate in God’s hands, did in fact commit themselves in primitive rafts to the icy waters of the north sea. Those who arrived alive on distant shores created monasteries where they landed. We also know that the prevailing currents will bring flotsam from Ireland to this part of the Norwegian coast. Moreover, we know that in the transitional period of Christianization that there were many stories of princesses who refused to be married to heathens, probably intended to bolster popular piety — but of course the legend is much more beautiful than the facts. 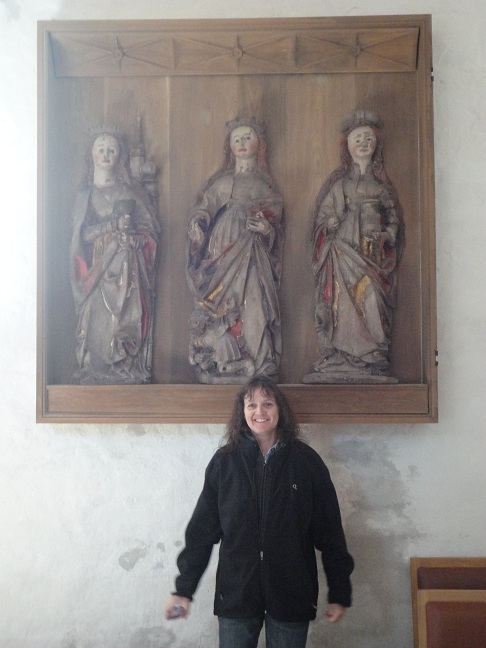 My sister with wooden carvings of St. Sunniva, St. Borni, and St. Ingeborg, but we were told that it is likely there were originally carvings of St. Barbara, St. Catarine, and Mary Magdalene, executed in a German workshop, and saved from the furies of the Reformation by their creative adaptation to local legend. While on Kinn we were told a local legend about the life of Saint Borni after she arrived on Kinn. She contracted with a local man, perhaps a supernatural character (perhaps even a species of troll), to build the church that is the church that still stands on Kinn. He said he would do so if Borni would marry him, but Borni was as horrified of marrying him as Sunniva had been horrified at the idea of marrying a Viking. So he changed his offer: he would build the church, and if she could guess his name before he was finished, she would not have to marry him. When the church was nearly finished, Borni traveled to a neighboring island and heard the builder’s folk singing his name in honor of his presumed upcoming nuptials. So Borni returned, called the builder by his name, and so shocked him that he dropped the belfry on the ground next to the church, where it is to be seen today, instead of installing it on the top of the church. 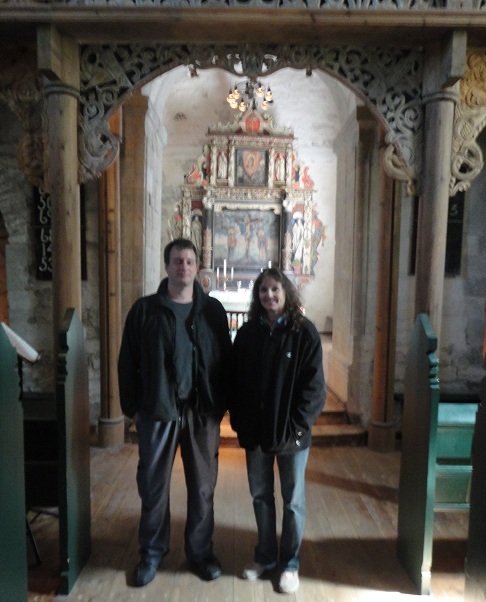 My sister and I inside the church at Kinn. Above our heads is a very rare thirteenth century lectorium, carved by an English monk. 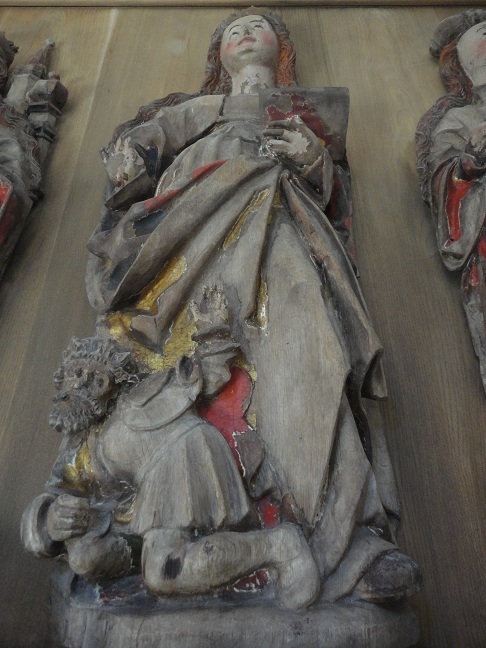 It is nothing short of remarkable that this piece of woodcarving survived the centuries. I have read books and heard lectures in which the writers and speakers insist that it is an anachronism to attribute to medieval pilgrims the motives of modern travelers; that medieval pilgrims were engaged in a religious duty, and that this ideological focus transformed the act of pilgrimage into something distinctive. Well, yes and no. It is right for scholars to point out what makes medieval pilgrimage distinctive, but I don’t buy the most general formulation of this thesis — not for a minute. It is impossible for me to believe, among the vast numbers of peoples who went on pilgrimage throughout the European Middle Ages, that all were solely motivated by a narrowly-conceived religious ideology, and that in visiting distant places never found themselves marveling at the sights in a way indistinguishable from the modern tourist. Pilgrimage is what Wittgenstein would have called a “form of life.” Or, to use Marxist language, we can find in pilgrimage throughout the ages — whether ancients visiting the Oracle at Delphi or medievals visiting the relics of Saint Sunniva or moderns visiting the lands of their forefathers — an invariant material infrastructure that can be distinguished from the ideological superstructure. In other words, we are all doing pretty much the same thing, whatever we may understand ourselves to be doing. 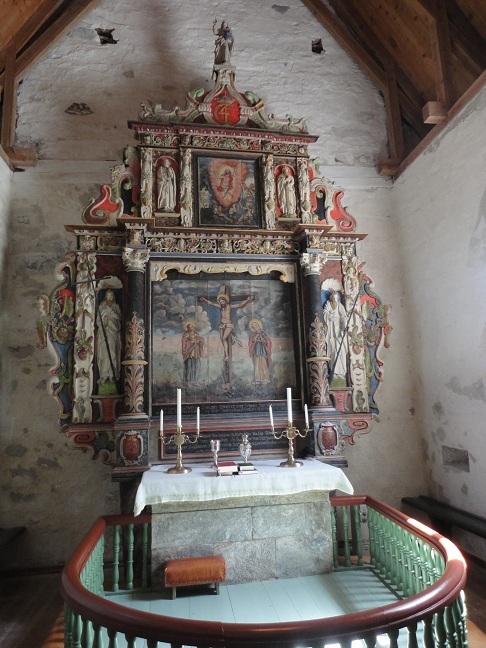 The altar from the Kinn church has some early elements that date contemporaneously to the church — and the three female saints pictured above previously occupied the center of the altar where there is a painting today — but its appearance today mostly dates to the early eighteenth century. I, too, was on a pilgrimage when I visited Kinn. It was a familial pilgrimage, like my first trip to Norway in 1988, also with my sister who is traveling with me now. Our father’s mother was born on Kinn and was baptized and confirmed in the church we visited today. So while I would not hesitate to identify tourism as the modern form of pilgrimage, and to identify those great symbols of civilization like the Parthenon and the Taj Mahal as places of tourist pilgrimage, my pilgrimage to Kinn was more personal. It was important for me to see Kinn in order to understand where I come from, and to understand the form of life lived by my ancestors. In that way I become less the Other to my own past, to my own history (in the sense of otherness I described in Being the Other). 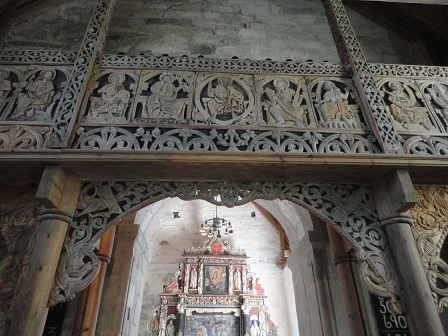 Another view of the 13th century lectorium from the Kinn church. When my father first told me about Kinn he emphasized its barrenness, that there was nothing there but fish. 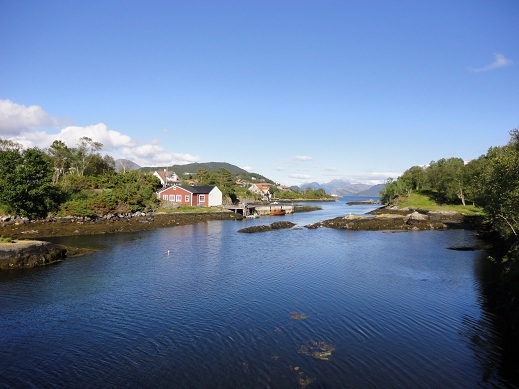 Today I learned that there was a lot of fish — the local guide said that in the late nineteenth century (my fraternal grandmother was born in 1891) that Kinn was so famous for its herring fisheries that there was a saying in Norway to the effect that you can go to Kinn and get rich. And the fishing boats were said to be so thick on the water that you could go from one island to the next by stepping across the boats like a bridge. This gave me a new perspective on Kinn even as at the same time it fitted in with my overall understanding of history. The rocky and barren coast of Kinn, though at one time in its history it is said that you could have walked across the boats to the next island, seen here in the distance. At the end of the nineteenth century a number of developments were coming together — increasing populations, increasing commerce, the growing influence of the industrial revolution, and so forth — that meant that traditional resources that had been local staples were transformed into extractive industries and cash crops for an export industry. At Kinn, herring and salmon were the cash crop; they were put on ice and sent to Bergen the same day, and then sent from Bergen to England the next day. At the same time this was shaping the lives of my father’s family in Norway, it was also affecting my mother’s ancestors half a world away at the mouth of the Columbia River, where salmon fishing became a booming industry at the same time, before the over-exploited fisheries could no longer support that level of harvesting. Fortunes were made and fortune vanished almost as quickly. That is the way of the world. 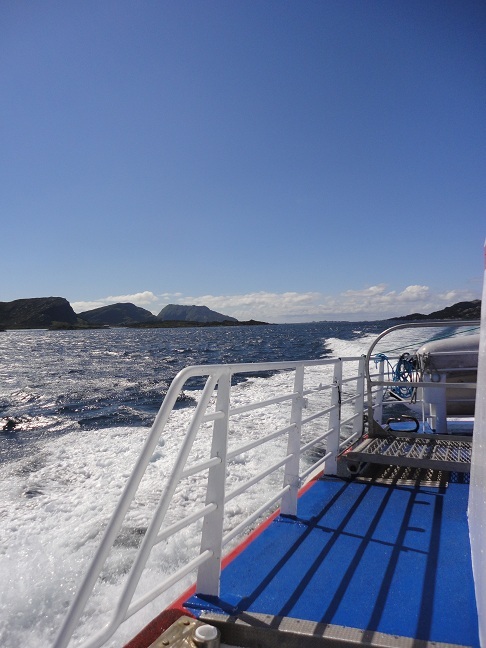 The boat that took us back to Florø from Kinn. The weather could not have been more perfect. That is how I put it all together — at least, that is what I try to do — bringing together the big picture and the local picture, filling in the details that illuminate the whole by going to the point of my origins and finding what stories I can. In the end, all we have are our stories, and now I have part of the story of my family, with the story of Saint Sunniva and her sisters thrown in for good measure. Evening in Floro after our trip to Kinn and a visit to the local Kystmuseet, documenting life along the Norwegian coast. The thesis that epistemic space is primarily shaped and structured by geometrical intuition may be equated with Bergson’s exposition of the spatialization of the intellect. Bergson devoted much of his philosophical career to a critique of the same. Bergson’s exposition of spatialization is presented in terms of a sweeping generality as the spatialization of time, but a narrower conception of spatialization in terms of the spatialization of consciousness or of human thought follows from and constitutes a special case of spatialization. One might well ask, in response to Bergson, how we might think of things in non-spatial terms, and the answer to this question is quite long indeed, and would take us quite far afield. Now, there is nothing wrong with going quite far afield, especially in philosophy, and much can be learned from the excursion. I find this particularly interesting because it is, essentially, a Kantian argument. I discussed just this argument of Kant’s in Kantian Non-Constructivism. It was a vertiginous leap of non-constructive thought for the proto-constructivist Kant to argue that he could imagine empty space, but not spatial objects without the space, and it is equally non-constructive for Wittgenstein to make the same assertion. But it gives us some insight into Wittgenstein’s thinking. Understanding the space of atomic facts as logical space, we can see that logical space is driven by logical necessity to relentlessly expand until it becomes a kind of Parmenidean sphere of logical totality. This vision of logical space realizes virtually every concern Bergson had for the falsification of experience given the spatialization of the intellect. The early Wittgenstein represents the logical intellect at its furthest reach, and Wittgenstein does not disappoint on this score. From the perspective of natural history, recent thought on human origins has shifted from the idea of a “smart ape” to the idea of a “bipedal ape,” the latter with hands now free to grasp and to manipulate the environment. Before this, before human beings were human, our ancestors lived in trees where spatial depth perception was crucial to survival, hence our binocular vision from two eyes placed side by side in the front of the face. Color vision additional made it possible to identify the ripeness of fruit hanging in the trees. In other words, we are a visual species from way back, predating even our minds in their present form. With this observation it becomes obvious that the human mind emerged and evolved under strongly visual selection pressure. Moreover, visual selection pressure means spatial selection pressure, so it is no wonder that the categories native to the human mind are intrinsically spatial. Those primates with the keenest ability to process spatial information in the form of visual stimuli would have had a differential survival and reproductive advantage. This is not accidental, but follows from our natural history. But now I have mentioned “natural history” again, and I pause. Temporal selection pressure has been no less prevasive than spatial selection pressure. All life is a race against time to survive as long as possible while producing as many viable offspring as possible. Here we come back to Bergson again. Why does the intellect spatialize, when time is as pervasive and as inescapable as space in human experience? With this question ringing in our ears, and the notable examples of philosophical logical-spatial equivalence mentioned above, why should we not have (parallel to Wittgenstein’s exposition of logical space) logical time and (parallel to Davidson’s exposition of logical geography) logical history? Perhaps I ought to make the effort to think things through temporally in the same way that I have previously described how I make the effort to think things through selectively when I catch myself thinking in teleological terms. In the meantime, it seems that our geometrical intuition is a faculty of mind refined by the same forces that have selected us for our remarkable physical performance. And as with our physical performance, which is rendered instinctive, second nature, and unconscious simply through our ordinary interaction with the world (all the things we must do anyway in order to survive), our geometrical intuition is often so subtle and so unconsciously sophisticated that we do not even notice it until we are presented with some Gordian knot that forces us to think explicitly in spatial terms. Faced with such a problem, we create sciences like topology, but before we have created such a science we already have an intellect strangely suited to the formulation of such a science. And, as I have written elsewhere, we have no science of time. We have science-like measurements of time, and time as a concept in scientific theories, but no scientific theory of time as such. There is, as I see it, a reciprocity between methodological naturalism and conceptual naturalism: each is necessary to the exposition of the other; each is clarified by the clarity of the other. Methodological naturalism converges on conceptual naturalism; conceptual naturalism enlarges the sphere of phenomenon to which we can bring the resources of methodological naturalism. Both stop short of naturalism simpliciter, and a fortiori of ontological naturalism. This is the province of philosophy rather than of science, and it is perhaps one of the sources of anti-philosophy in science that science is ultimately bounded by philosophy. It is interesting to note in this section how Wittgenstein approaches the philosophy of mathematics almost gingerly in this passage. While the Philosophical Investigations touches upon the philosophy of mathematics in places, elsewhere in Wittgenstein’s oeuvre the philosophy of mathematics is central, the fons et origo of Wittgenstein’s thought. Here Wittgenstein seems to be coming at it again, although from a new angle: as though after the experience of formulating ordinary language linguistic philosophy he had passed through to the other side of thought and was prepared to return to the source of his thought, older and now wiser. Wittgenstein’s Tractatus Logico-Philosophicus — the only book-length work published during this lifetime — is through and through concerned with the philosophy of mathematics. The only contemporary philosophers Wittgenstein cited in this work were Frege and Russell, who had pioneered the doctrine of logicism, which is the position that mathematics is simply a highly developed form of logic, which amounts to the claim that there are no uniquely mathematical ideas, only logical ideas. So this early period of Wittgenstein’s thought was brought into being and sustained by philosophical reflection on mathematics. We know that this was true of the later period of Wittgenstein’s thought also. After revolutionizing contemporary philosophy with his Tractatus, Wittgenstein returned to Austria and hid out in the Alps as a village schoolmaster, where a few Anglo-American philosophers made the pilgrimage to seek him out and question him about the Tractatus. One of them managed to persuade him to travel to Vienna to attend a lecture by L. E. J. Brouwer, the father of intuitionism, then the most influential form of constructivist philosophy of mathematics. After this lecture, Wittgenstein began his slow, incremental return to philosophy. But it was a different philosophy. 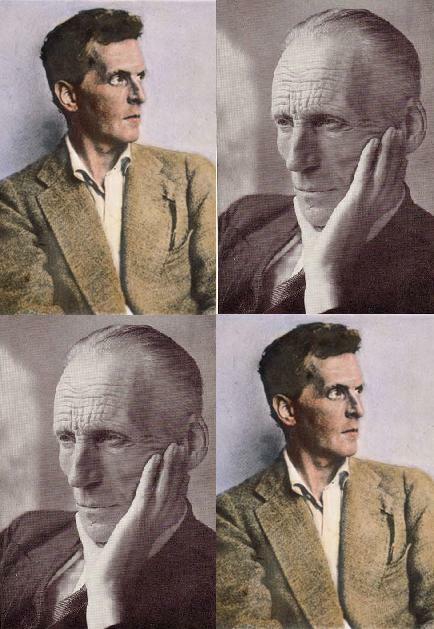 The works that Wittgenstein wrote in this period, which have been published posthumously, are sometimes called his Middle Period, to mark them off from the better known Early Wittgenstein (the Tractatus) and Late Wittgenstein (the Philosophical Investigations). These middle period works, too, are pervasively concerned with the philosophy of mathematics. Last February in Nothing contrasts with the form of the world I commented on one of these middle period works, the Philosophical Remarks. Though not nearly as well known as the Tractatus or the Philosophical Investigations, the middle period works are intriguing and fruitful in their own way. They have been an influence on my own thought. While Wittgenstein was writing the works of his later period he delved deeply into philosophical psychology. Several works of this nature have been published posthumously. The Philosophical Investigations is in a sense both the culmination of these efforts in philosophical psychology and a response to them. The response comes in the final section quoted above. Wittgenstein, in delving deeply into psychology, found psychology to be infected with conceptual confusions that would not, he thought, be ameliorated by workman-like progress based on the experimental method. Something more was needed, something different was needed, to deliver psychology from its conceptual confusions. Wittgenstein put much of contemporary mathematics in the same basket by comparing the conceptual confusion of set theory to the conceptual confusion of psychology. Here I decisively part ways with Wittgenstein, since I agree about the conceptual confusion of psychology, but I am hesitant over the conceptual confusions of set theory. It is not that I deny these latter confusions, but rather than I am hopeful about them (and, I guess, I’m not that hopeful about the former). Of course, many people are and were hopeful about what might be called the set theorization of mathematics. In many of Gödel’s later posthumously published essays (those that make up the contents of Volume III of his collected papers) we can see Gödel consciously groping toward a better conceptual formulation of the foundations of set theory. He saw the need and attempted to fill it, but the conceptual infrastructure needed for the decisive breakthrough (the kind of conceptual breakthrough that make it possible for Cantor to formulate set theory in the first place) wasn’t there yet. But Gödel was headed in the right direction. 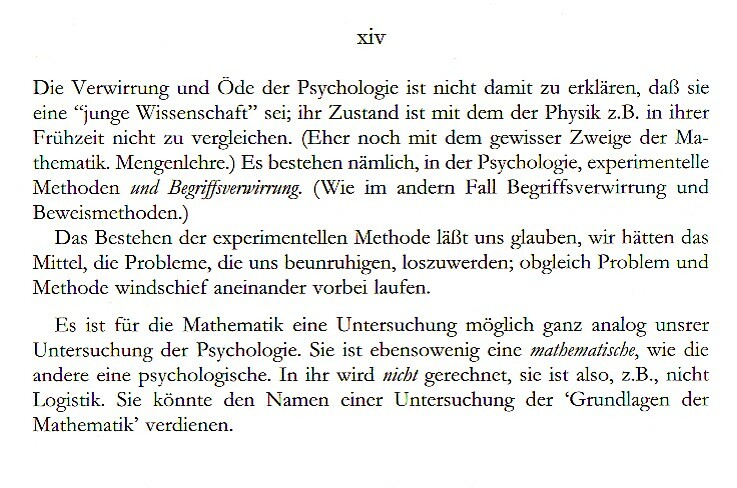 Although Gödel wasn’t influenced by the thought of the later Wittgenstein, the direction he was headed in was the direction that Wittgenstein outlined in the last section of his Philosophical Investigations, quoted above. That is to say, Gödel was doing conceptual work in the foundations of mathematics. This has been the exception rather than the rule. Since the time of Gödel and Wittgenstein the field has been dominated by technical work, work of the highest formal rigor, and also work of conceptual rigor, but not, it must be said, radical conceptual work. It is very difficult to characterize radical philosophy. Husserl spent a career trying to do so, and in his last years took pride in being able to call himself a genuine beginner in philosophy. But Husserl’s legacy (very much like the legacy of Wittgenstein and Gödel) has been dominated by philosophers who have done work of technical and conceptual rigor, but not radical work. Another problem stems from the political connotations of “radical,” which are connected to the Marxist tradition, which retains a vital connection to contemporary philosophy. So if you talk about radical philosophical thought, many people will assume that you’re talking about Marxism or some species of far left anarcho-syndicalism, and that is not at all what I have in mind. I made a first attempt to get at my conception of radical philosophical thought — which I see as following in the tradition of the later Husserl, the later Wittgenstein, and the later Gödel — in my post Jacob Bronowski and Radical Relflection. I haven’t returned to thus much, partly because of other work on which I have been engaged, and partly due to the intrinsic difficulty to radical philosophical thinking. But I want to note it in connection with the last section of the Philosophical Investigations quoted above. Radical thought, as I conceive of it, would not only be philosophically radical, but also scientifically radical. That is why I wrote the above post on Jacob Bronowski, who most philosophers would not recognize as having made any contribution to philosophy. But Bronowski, as I attempted to describe, did engage in radical scientific thought (and even attempted to popularize it) and this in itself constitutes a contribution to radical philosophical thought. We must learn from this radicalism wherever and whenever we find it. For a time it seemed that philosophical thought had been overtaken by science, and much of twentieth century philosophical thought seems like a self-parody as philosophers try to mimic the success of the physical sciences. This is what twentieth century logical empiricism and logical positivism is all about. But these philosophers learned the wrong lesson. Contemporary philosophers are starting to learn the right lessons. I have written several posts about the emerging school of philosophical thought called Object Oriented Philosophy (or object oriented ontology – “OOO”). One of the best things about this movement is the attempt to take science seriously as a source of insight for philosophical thought. A lot of analytical philosophers wouldn’t recognize this even to be the case, since OOO is largely formulated in the language of continental philosophy, though a close reading will make this obvious. Radical philosophy, however, cannot rest with accepting the insights of science or even accepting scientific knowledge or the scientific method as its point of departure. This is an important point of departure, but it is only the beginning. As I have attempted to point out in several posts (most recently in An Aristotelian Definition of Science), science is part of philosophy, and philosophy must then take responsibility for science. And for mathematics as well. You see, if philosophy must take science seriously, and science take mathematics seriously, then philosophy also must take mathematics seriously. Science, philosophy, and mathematics are all caught up in the same dilemma of needing radical conceptual clarification, even while each as it progresses adds more and more to the accumulated total based on a confused conceptual foundation. Of course, Wittgenstein took mathematics seriously, which is one reason he devoted the better part of his philosophical career to the philosophy of mathematics. 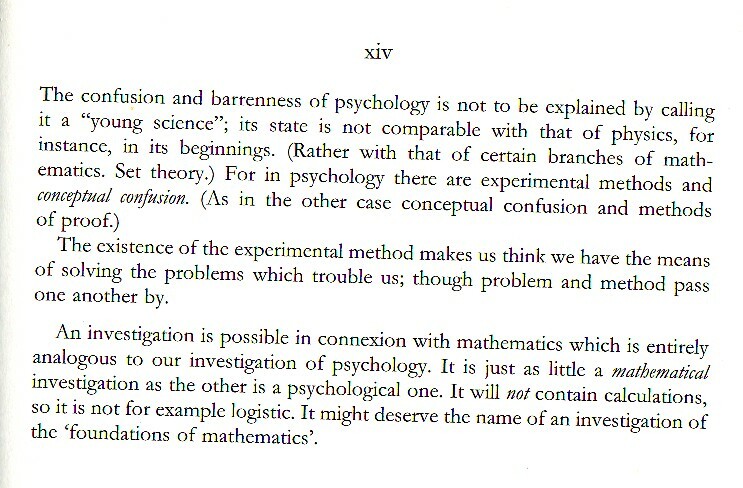 But while Wittgenstein mentions the conceptual confusions of psychology in the same section that he mentions the possibility of a foundational inquiry into mathematics parallel to his foundational inquiry into psychology, he doesn’t seem to have quite seen the full relationship between the two. But, then again, science and and especially psychology of that time was not mathematicized to the extent that it is today. All of the rigorous technical work that I mentioned above has had the consequence of accelerating the mathematization of the sciences (think of economics today, or even branches of biology like theoretical ecology). Mathematics provides the framework whereby other bodies of knowledge are rendered scientific, but is mathematics itself scientific, or is it rather part of the structure of science itself, and therefore neither scientific nor non-scientific? If mathematics is an assumption of and part of the structure of science, then it is to be put on a par with parsimony, induction, uniformitarianism, and methodological naturalism. If, on the other hand, mathematics is science, is a part of science, then it is not on the same level of the philosophical principles of science that I have just mentioned, but is subject to them just as is the rest of science. It could be argued that the principles of mathematics make themselves manifest in science through the medium of mathematics, so that mathematical principles are ultimately also scientific principles, and they are to be understood as being on a level with the other principles of science (such as those I mentioned above). This is an interesting idea, and it is, in fact, my first reaction to this as I begin to think about it. There is even a sense in which this is parallel to logicism, in which logic and mathematics ultimately share the same principles. However, I want to immediately point out that I do not regard this as anything even approaching a definitive formulation. It is only a first, instinctive, intuitive response to the question I am attempting to pose to myself. We need radical philosophical thought, but it is difficult to do, requiring a real conceptual effort above and beyond the norm — the “norm” of which might be called the norm of normal philosophy, conceived in parallel with what Kuhn called normal science — and so it is rare. We need technical and conceptual rigor as well. These are also difficult, but slightly less rare. Ultimately what we need is both: we need radical rigor. One of the most memorable and enduring aspects of Wittgenstein’s later work is his conception of family resemblance. Wittgenstein in his Philosophical Investigations formulates an essentially anti-essentialist position, and his account of family resemblances is an attempt to state how things resemble each other without sharing some single “essence.” He wanted to get away from the idea there there must be something in common, and to this end he urged his readers to look for themselves and see if there is anything in common — say, for example, among all games. Wittgenstein described family resemblances as, “…a complicated net of similarities which overlap and intersect.” This translation is due to Walter Kaufmann (Critique of Religion and Philosophy, Princeton: Princeton University Press, 1978, p. 55), which is a rather more felicitous rendering than the familiar Anscombe translation: “a complicated network of similarities overlapping and criss-crossing,” (Ludwig Wittgenstein, Philosophical Investigations, The German Text, with a Revised English Translation, Third Edition, Malden, Oxford, and Victoria: Blackwell Publishing, 2003, section 66, p. 27e). Stephen Jay Gould, “Nonoverlapping Magisteria,” Natural History 106 (March 1997): 16-22; Reprinted here with permission from Leonardo’s Mountain of Clams and the Diet of Worms, New York: Harmony Books, 1998, pp. 269-283. Dawkins goes on for several pages in this vein, but the only reason I cite Dawkins here is that he represents the antithesis of the NOMA position outlined by Gould. What interests me in this debate between Gould and Dawkins is that the NOMA and anti-NOMA positions do not exhaustively divide the field of opinion. In fact, however heretical to the orthodox, I think that one of the most prevalent views held today in industrialized Western nation-states is the antithesis of both Gould and Dawkins. I propose to call this position COMA, which should be understood to stand for COinciding MAgisteria. It is difficult for me to give a good formulation of COMA, partly because the idea, while ancient, is new to me, and it is not my own position. So I have no definitive formulation. I will rely upon my reader’s sympathy and indulgence to provide what I leave out in my account of COMA. COMA is simply this: that religion and science are simply alternative formulations of one and the same truth. The dogmatically religious insist upon putting everything in religious terms and denying the contributions of science, while the dogmatically scientific insist upon putting everything in scientific terms and denying the contributions of religion, but ultimately there is only one truth of the world, which is studied from the varying perspectives of science and religion (inter alia). I have had many people say things like this to me personally. While I can’t cite any locus classicus, but I’m sure that someone, somewhere, has written down this obvious point of view. I will go further, however, and state that even among NOMA, anti-NOMA, COMA, and whatever anti-COMA might be, that these positions still do not exhaust the field of opinion. What lies beyond NOMA and COMA? Wittgenstein. Wittgenstein’s conception of family resemblances takes another step with possible magisteria, which is that step beyond either wholly overlapping (as with COMA) or being mutually exclusive (as with NOMA), such that that magisteria may intersect (which Anscombe translates as “criss-cross”). I’m sure you get the idea. Gould and Dawkins, NOMA and SOMA, present regions of thought as spatial areas (much as Frege does in his exposition of tertium non datur in the Foundations of Arithmetic). Well, concepts as we usually find them in the real world only present these kind of ideal boundaries in the abstract. In actual fact, the boundaries of a given concept interpenetrate related concepts, often to the point that it is difficult to distinguish them. This, I think — family resemblances that overlap and intersect — is the proper way to understand the relationship between religious and scientific concepts. Though I will, again, go one step further. I mention in my “The Moral Imperative of Human Spaceflight” paper that Wittgenstein has left an item off the relationships of family resemblance: conflict. The individual variation that both lies at the basis of natural selection and which gives each of us our unique features, is that element of conflict in family resemblance, which is never total or absolute. Despite all the talk about so-called “militant atheists” like Dawkins (and Dennett, and others), it has in fact become quite trendy to downplay the conflict between science and religion. I listened to a set of lectures from The Teaching Company, Science and Religion — a pure exemplification of the spirit of revisionist history — in which the lecturer, Professor Lawrence M. Principe, Ph.D., ridicules what he calls the “The Warfare Thesis” and attempts to show that, because many eminent scientists were in fact deeply pious and religious, there really hasn’t been any conflict between science and religion. While I enjoyed the lectures, I didn’t agree with them, and this was one of those clear-cut cases in which historical revisionism seems to be carried to its own self-fulfilling prophecy. But this is merely an aside in the point I wish to make today, and that point is that NOMA is really not all that common a view, that COMA is probably more prevalent, but that neither NOMA or COMA sufficiently capture the relations between science and religion, which might better be described in terms of Wittgensteinian family resemblances. Not that science and religion resemble each other, but that their relations are like the relations that hold between things that do resemble each other. This is an obviously imperfect exposition. Perhaps with time I can frame my point with greater clarity.